Rules and Setup: Do you enjoy organizing things? Do you take satisfaction in seeing rows of resources lined up, just waiting to be earned, traded, and spent? Well then, do I have the game for you! With no less than 450 components, there is much to be sorted, organized, and all set up. Pictured below is my setup for a four player game. Too much? Is this level of presentation required? Of course not, but hopefully, dear reader, you get as excited about getting a game all set up as I do. Feel free to let me know if I’m just crazy. Besides, I find most players are drawn to a table that is well organized. 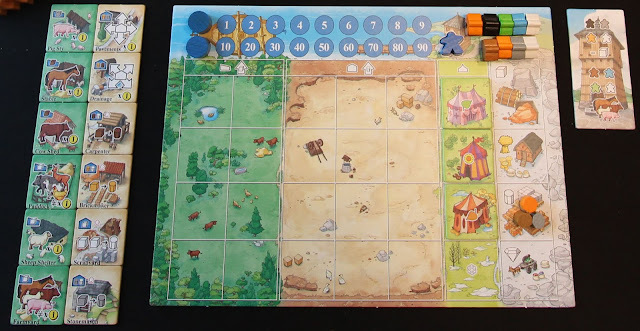 Home tiles - Six farm and six village tiles, placed in two columns next to your player board. Fair tiles - One random tile from each of spring, summer, and fall, placed on the fairground spaces on your player board. Country boards - Equal to the number of players, with the first board displaying the one-player icon, second board the two-player icon, etc. Spring country tiles - Spring tiles only, placed into the bag, and draw 8 randomly displayed near the country boards. Boats - Four random boats placed spring side up. All other components sorted into separate piles, within reach of all players. 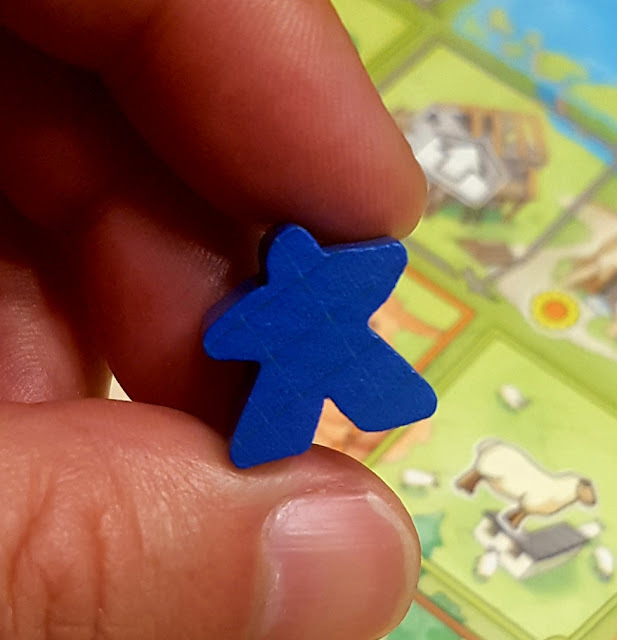 Following suit with previous games in the Key series, we once again visit the land of Keydom, spending a year (four seasons) trying to best build our farm, village, and economy. In doing so, we also hope to successfully hold fairs at the end of each season, and use shipping opportunities to buy and sell goods. 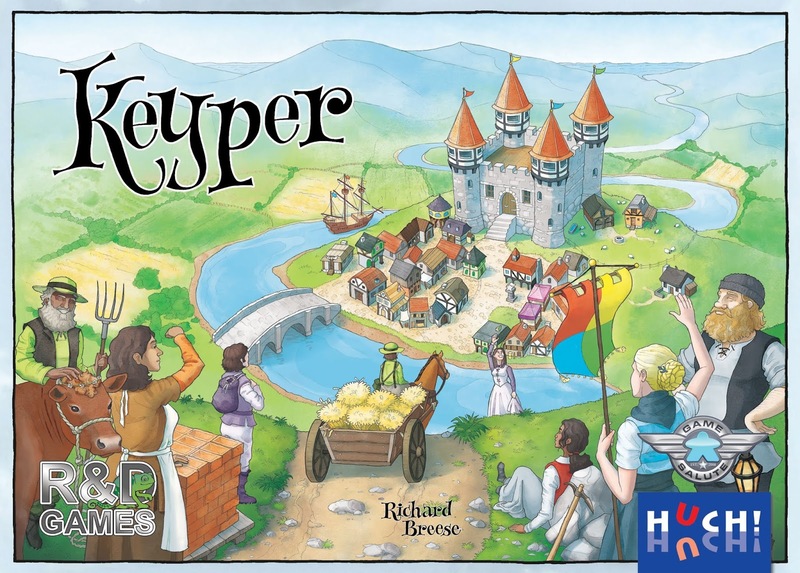 Keyper’s mechanics fall in line with many others in the Key series of games; namely, worker placement with strong player interaction. You do not receive your own workers in your player colour, but instead receive a team of specialized workers (listed in setup) that are most efficient if used in their area of expertise. For example, if one was to use a farmer (green keyple) on a space that provides clay (orange field icon), you would get a single action. If that same farmer was used on a space that provides wheat (green field icon), you would get to perform that action twice. If that farmer was getting wheat, and also had a Joiner (about to be explained), they would get a whopping three actions! Such efficiency! But how does one get a Joiner? I’m glad you asked, as this is what creates very little downtime in the game. Each time someone takes an action on the country boards, they then ask other players if they wish to join the action, going clockwise around the table. Only one player may join, but if they do, both players taking the action may take it up to three times (depending on the colour matches of keyple/space). This leaves all players very invested in each other’s actions, and in constant engagement. More on this in the gameplay section. Another aspect of Keyper is tile placement, as each player tries to build their farms and villages. Not only will these tiles provide potential points at the end of the game, but they will also provide actions that only you can take. Depending on the tiles used, even placement orientation can play a role in final scoring, so be sure to plan ahead! Lastly, there is the set collection side to Keyper. There are a wide variety of farm, village and fair tiles that all provide points as long as you have collected the corresponding resources to match. But be careful, as each tile can only be scored a maximum of four times. This encourages diversity and planning. A typical turn in Keyper is not that complicated. You may take one of up to four possible actions. Play your keyper onto a country board. 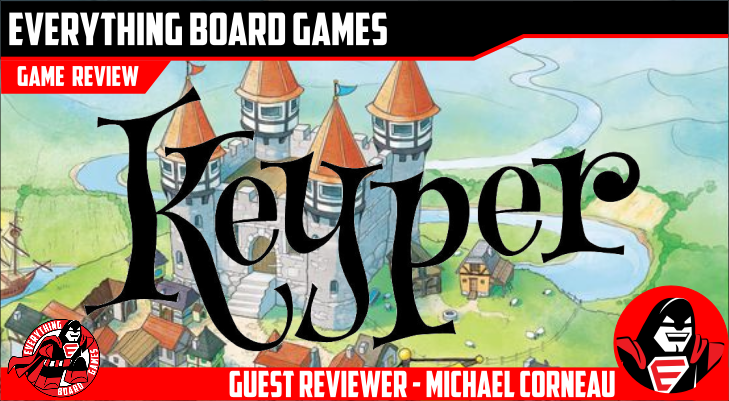 Play a keyple onto a country board. 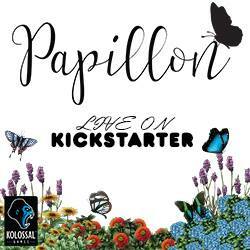 Play a keyple onto your player board. If no keyper or keyples left, you can take a laydown action. To help with your first couple plays, they have even provided flowcharts for each of the four actions, each one conveniently placed on one of the sides of the box bottom. The first listed action is the most straightforward, yet requires the strongest timing. I had mentioned in setup that you do not have keyples in player specific colours. So how do you know whose keyples are whose when it comes time to finish a season? That comes down to which country board you claimed with your keyper. (Or as I have come to affectionately call it, your John Travolta meeple.) You only have one keyper, and when you play it onto a country board, you are claiming that board. This does two things: It becomes the board that you modify at the end of the season (more on this exciting mechanic in a bit), and you claim ALL keyples on that board for the following season. (Or in the case of it being winter, this becomes the board you use for scoring). The second and third listed actions have you playing a keyple, with the difference being whether it is played on a country board, or played onto your player board. If it is played onto a country board, you would then ask if anyone wishes to join your action, making it more efficient for both involved players. If played onto your player board, it may not be followed by another player. The last action may only be performed when you no longer have any keyples, or a keyper to play. In this case, you may repeat actions that have already been played on your player board, or on the country board you have claimed, by laying keyples down. These actions continue clockwise around the table, until one player has played the last keyple/keyper at the table. Each other player then gets to perform one final laydown action. This signals the end of the season where you then (if planned correctly) get to hold your fabulous fair to show off your wood/sheep/gems/etc. (Sure, they may not be the most exciting fairs, but they get you points!) Once you have confirmed you have housing for all of your animals (and set free any that couldn’t fit), you then reset for the next season. This is where I finally get to introduce the most fascinating component: the country board. Each player gets to set one of the country boards to any side of their choosing, that matches the upcoming season. To do this, you will be involved in a slight bit of origami/magic/voodoo, as you flip halves of the board in various directions finding new combinations. This board will be the first thing new players will play with when they see it, as it can be nearly hypnotic. 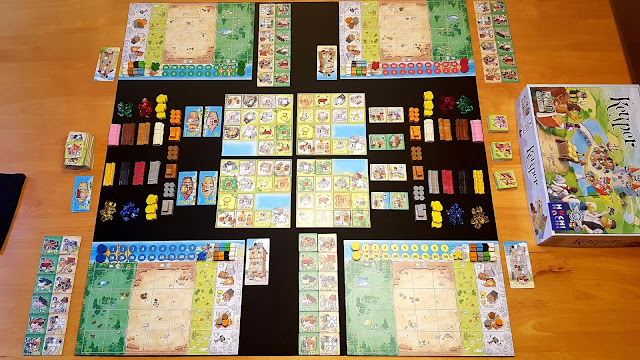 Along with each player getting to set a country board, there will also be a fresh set of boats arriving with which to do business, new country tiles for player board possibilities, and all keyples that were on your selected country board now go to your supply, up to the maximum of 8 (9 in a 2 player game). This is done for a total of four seasons, where players then add up their shipping track score, farm tiles, village tiles, and fair tiles. Most points wins! If you have played any games in the Key series, you know what to expect out of the artwork, and Vicki Dalton does a wonderful job maintaining the style that Juliet Breese has created in many of the Key series of games. You can tell at a glance that you are visiting the world of Keydom, and to me, this visual consistency is wonderful. Then there are the components. So…many…components. And they are all fantastic. Such a delightful variety of animeeples and gems, plus the magic that is the country boards. There is plenty here to draw in all kinds of players. Fantastic component quality, combined with many choices, makes Keyper a feast for the eyes, and the brain. There are many meaningful decisions to be made, such as the right timing for claiming a country board, or which direction to specialize, yet not get *too* focused. There is a high level of player interaction with the join action, but nothing that is “take that” which would otherwise turn away some player types. Like many worker placement games, there are a variety of paths to victory. A game group with players that are prone to analysis paralysis may end up staring at the board too long, unsure where to start. In this case, especially for beginning players, I recommend focusing on their upcoming fair tile. This gives some focus to their choices, and has them figure out how to accomplish different goals one element at a time. The only other “potential” negative would possibly be the lifespan of the country boards through the frequent flipping and fondling, of which there will be lots, even when not necessary. However, sturdiness doesn’t appear as though it will be an issue, as they are very well built. So I guess my bottom line here is that the words “bad” and “Keyper” don’t belong in the same sentence. Anyone that has played worker placement games will know the loop in which you occasionally get stuck. You need item X. But to get X, you need item Y, which cannot be obtained without item Z, and you eventually return to where you started… needing item X. In the case of Keyper, this could be needing bricks to build a country tile. The bricks require clay to make. The clay is most efficiently obtained using the worker you wanted to use to build the country tile in the first place. Well, in a delicious bit of symmetry, this is almost how the country boards feel. You start flipping halves of the board around, looking for the best combination of actions for yourself, and before you know it, you’re staring at the same board with which you began! There are many little layers of puzzles to be solved in Keyper, and I think this allows for a great deal of replayability. Many directions to take, and each one could be built around the randomized starting country tiles on offer. This means you won’t necessarily be able to use the same strategy from game to game as efficiently, and that really is the essence of Keyper. Efficiency. One element of claiming country boards that will not be apparent in your first play or two will be the keyples that come with it. Sure, seeing one board with more keyples than others may make the choice obvious, and you’ll want to get those keyples before anyone else. However, just as important can be the colours of the keyples on that board. You begin the game with a selection of each type of keyple, but via the nature of the join action, keyples quickly become pairs on the country boards. If you are building an engine that requires playing on a lot of orange squares, grabbing a country board filled with green keyples means your actions will be weaker. Efficiency. Do not be afraid of having fewer keyples than other players. I love the laydown actions that Keyper provides. This means you can run out of keyples a few turns before anyone else, but you are still able to keep laying down keyples to continue to take actions. With careful planning, this will not only keep you playing, but even provide repeat actions that you have already taken and need more of. Efficiency. After every game I played, I looked at my player board, looked at the country boards, and immediately wanted to play again. I could see the small errors made, how to plan better, how to become more efficient. Yet, the next game will have a randomized setup, which means just like the country boards themselves, this could be an endless loop of continual plays. How can this be anything but a good thing? This would be a great addition to anyone’s game collection that enjoys the worker placement genre. Also for anyone that enjoys making things into more/better things, visiting the lands of Keydom, and especially those that enjoy flipping boards in their hands like a Slinky! 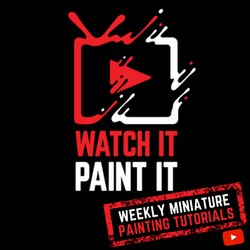 Michael Corneau can be found live streaming the Teach & Play series every Monday at 8pm Eastern, where he teaches and plays through a different game each week. These are streamed live simultaneously on both the Dice Tower YouTube and Twitch channels, and can also be found on the To Die for Games channel. He avidly posts about games on his Instagram account as @pawlom, and tries his best to keep in touch on Twitter as @pawlom21 (but needs to try harder). When he isn’t holding a rulebook in his hands, he is off running, biking, blading, or enjoying a craft beer… usually not simultaneously.